Cafe Oven’s milk patbingsu derives its addictive interplay of textures and flavors from three basic components ― red beans, shaved ice and milk sauce ― three elements that seem deceptively easy to master. Fans of this traditional summer treat know better. When the red beans are good, when the shaved ice is perfect and when the ice’s sweet milk drizzle is spot-on then a bingsu, in its classic and simplest form, becomes transcendent. Perhaps that is why Korean shaved ices like Cafe Oven’s old school rendition are some of this summer’s hottest bingsu. Pared down, devoid of nouveau toppings or syrups, these cool retro desserts not only stir up feelings of nostalgia, when done right, they also taste very good. Superfine ice, satiny on the tongue, rich with the slightly sweet flavor of milk sauce, acts as the perfect foil for the beans, which are not mushy, still intact, and velvety, nutty and lightly sugary. That trio of flavors and textures is exactly what makes the patbingsu at Cafe Oven so memorable. “I think it is all about how much care is put into it,” said Cafe Oven chef Han Seong-eun, who revealed that over four hours of hovering over the stovetop, keeping a sharp eye on the red beans, is crucial to the shop’s bingsu. “My mom started to cultivate red beans and we use them to make our bingsu,” said owner Choi Chang-seo, husband to chef Han, explaining that a year after the shop opened in 2006, his mother decided to provide a helping hand by growing the beans herself. According to Choi, the beans are grown in South Chungcheon Province and when the supply runs low red beans from North Jeolla Province are also used to craft Cafe Oven’s bingsu. “Now people eat bingsu for the red beans,” Han, 35, explained. 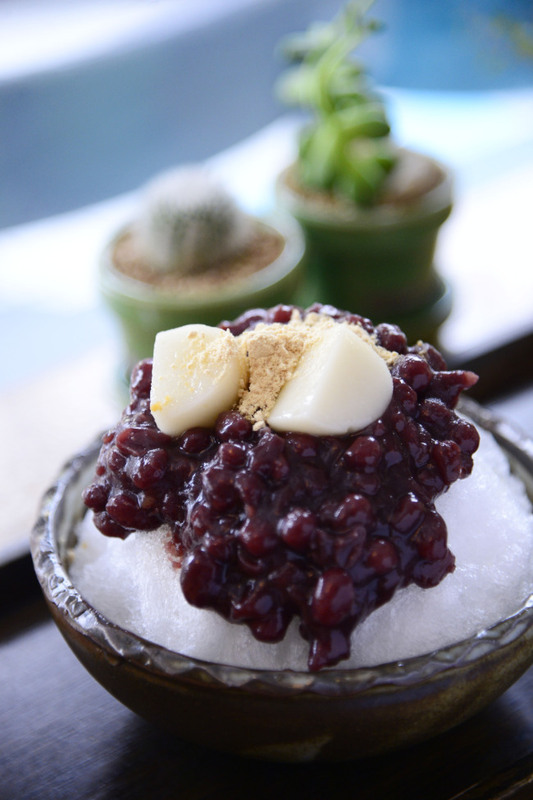 Red beans, it seems, are the linchpin to Cafe Oven’s shaved ice as well as to bingsu in general. With red beans taking center stage, Cafe Oven owner Choi recommends eating his establishment’s bingsu without mixing the beans and ice together. “If one eats each layer separately one can feel the textures of the red beans and ice,” said Choi, 39. Naturally, if the spotlight is on the beans, then it seems almost inevitable that, “the focus is homemade this year,” as Ahn says. “Make it simple, homemade,” Ahn, 34, elaborated. In short, because the quality of the beans and how they are made matters, that in turn, results in a pared down bingsu that allows the red beans to take the lead. “Places are going simple because those spots have confidence in their ice, their milk sauce and their red beans,” Hwang, 33, explained. Both Granum and the newly-minted red bean cafe, Haba Cocina, are no exception to the rule. Granum Dining Lounge’s retro treat features made-from-scratch red beans over a bed of shaved ice soaked in a sweet milk sauce. A smattering of walnuts and almonds and a scoop of housemade vanilla ice cream crown the bingsu. This, according to Ahn, is a significant departure from last year’s more “complicated,” fruit laden variation. At Sinsa-dong’s Haba Cocina, “our red beans are 100 percent domestic,” said Hwang, who added the red beans are prepared in-house along with the milk sauce. Haba Cocina’s most basic bingsu, the Haba ice flake, is truly pared down. Soft shaved ice soaks in a sweet milk drizzle. Heaps of red beans are piled on and topped with several pieces of rice cake. The resulting treat is tasty, a pleasant combination of creamy milk, silken ice and sweet red beans. While the bingsu has gone retro, Hwang is quick to note that this is not a true-to-life old school formula. “Unlike the past, when the ice was more granular, the ice is very fine and melts in the mouth now,” said Hwang. “Fruit or fruit cocktail was used to top bingsu, which was eaten mixed altogether,” Choi recalled the colorful, sweet shaved ice of yore when powdered milk was often used. Now, condensed milk and milk are generally used to create that lip-smacking, rich drizzle. According to Choi, not only has the bingsu been modified to suit today’s palates, it has also gone more high-end, where now it is a major headline dessert at hotels and a growing number of shops whose primary specialty is the bingsu itself. “Now it has become an upscale dessert,” said Choi, explaining how there was a time when the bingsu was considered more of a lowbrow treat, a sideline act. “Three years ago bingsu became very popular,” Be Sweet On and La Pomme co-owner Joung Eung-do, whose own dessert cafes sell a Japanese-style bingsu, pinpointed the moment when he believes the shaved ice treat took off. Ever since bingsu became the ultimate sweet of the summer, it seems competition has gotten fierce. “With the emergence of shops that specialize in bingsu and with bingsu now a leading dessert, competition has become extreme,” said Cafe Oven’s Choi. In the midst of a heated battle to draw bingsu lovers and in the quest to keep it fresh, Ahn revealed that bringing a multicultural slant to the sweet is one way of doing something new. To that end, a halo-halo-inspired bingsu was developed for the Granum. “We specialize in Southeast Asian cuisine,” Ahn explained why he took his cue from the shaved ice treat that hails from the Philippines. Housemade purple sweet potato ice cream adorns a red bean-free dessert decorated with slivers of coconut flesh, dragon fruit and cherries. Ahn says that it is the novelty factor that brings in the orders. “People order halo-halo because they do not know what it is,” said Ahn. At Be Sweet On, a Hongdae-based cafe that specializes in French-by-way-of-Tokyo desserts, and its new second store, La Pomme, customers can dip into a Japanese version of the bingsu. “We serve a run-of-the-mill Kyoto-style bingsu,” said co-owner Joung, 33. Kakigori, a Japanese shaved ice treat, was first introduced to the menu of Be Sweet On approximately three years ago and is now also available at La Pomme in Garosugil, which opened about a month ago. “Our bingsu was popular from the beginning,” said Joung. 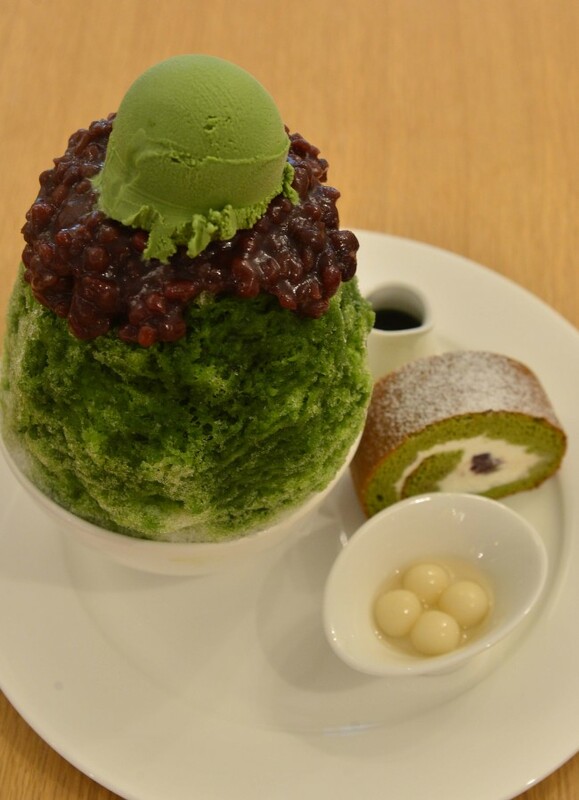 Meant to be ordered for two, though it can be ordered for one, the green tea kakigori at La Pomme and Be Sweet On is a massive dome of soft ice, doused with syrup fashioned from Japanese matcha, topped with homemade domestic red beans and homemade matcha ice cream. Rice cakes soaked in sugar syrup, a slice of matcha roll cake, green tea and extra matcha syrup accompany the dessert. Decadent and ginormous are the words that come to mind when presented with this delectable summer treat. Watching customers’ faces light up when this heaping tray of sweet goodness arrives gives light to the realization that while it may be tough competition for bingsu makers, for bingsu lovers if it means more treats like this then let the games begin. Open 2 p.m. to 11 p.m. weekdays, weekends 1:30 p.m. to 10:30 p.m.